The northern sea otter subspecies (E. lutris kenyoni), is found in the Aleutian Islands, Southern Alaska, British Columbia, and Washington. Within Alaska, there are 3 stocks. The Southeast stock can be found in the coastal waters of Southeast Alaska. The South central population spans from west of Glacier Bay to the eastern edge of Cook Inlet. The Southwest population stretches from the western edge of Cook Inlet out the Aleutian Islands. In Alaska, sea otter populations in Southcentral and Southeast Alaska have stabilized or are continuing to increase. However, in southwest Alaska, sea otters have experienced a sharp population decline in the last 20 years. In 2001, the US Fish and Wildlife Service (USFWS) designated the Aleutian Islands population of northern sea otter as a candidate species for listing under the Endangered Species Act (ESA). 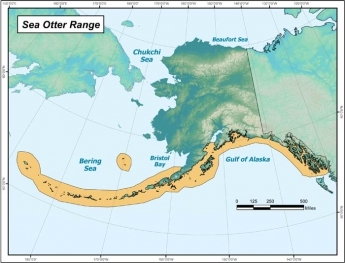 In 2002, they expanded the candidate stock to include all sea otter populations in southwest Alaska. In 2004, USFWS proposed listing the southwest Alaska northern sea otter under the ESA, and in 2005, the population was listed as threatened. Their main prey species include sea urchins, crabs, clams, mussels, octopus, fish, and other marine invertebrates. Sea otter teeth are adapted for crushing hard-shelled invertebrates such as clams, urchins, and crabs. Female sea otters reach sexual maturity at 2–5 years of age. Males become sexually mature at 4–6 years of age. 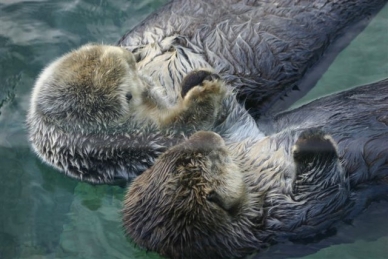 Sea otters breed throughout the year, but in Alaska most pups are born in the late spring. Female otters give birth to one pup at a time. Pups are 3–5 pounds at birth and light brown in color. Breeding males are territorial and defend areas where females are concentrated. They will drive other males out of their territory. Non-breeding males may form their own groups in an area just outside the breeding territory. Inhabit coastal, shallow waters with sandy or rocky bottoms, which include bays, inlets, fiords, and harbors. They rarely come ashore and when they do, remain close to the water. Threats in the Wild: Predation, overharvest, fishery interactions, disease, and oil spill. In order to maintain its body weight, a sea otter must eat 25% of its body weight per day. 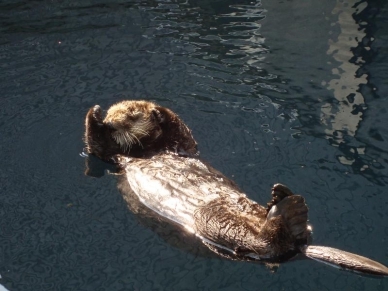 Ninety percent of the world’s sea otters live in Alaska’s coastal waters. Sea otters have the densest hair coat of any mammal, with 800,000 to one million hairs per square inch.